Almost all of us will have experienced the suffering caused by back pain. Partly due to our increasingly sedentary lifestyles, this condition is incredibly common. If you’re suffering from a bad back, even the simplest of tasks become a real struggle. And unfortunately, the pain doesn’t go away when it’s time for bed either. Getting a restful night’s sleep can sometimes feel impossible, so getting the best mattress for back pain in the UK is an investment in your health. Switching up your old mattress can make a huge difference to your comfort if you have a bad back. Remember that you spend around a third of your life in bed, that is why mattresses that that are comfortable are important. In this article, we bring you a guide to five of the best mattresses for back pain available in the UK – so you can finally get some much-needed rest and relief. Which Sleeping Position Is Best for Back Pain? The Casper is our favourite choice and for plenty of excellent reasons. Made from four layers of premium materials, each layer adds to your comfort and support, for better alignment and a great night’s sleep. It is 24cm deep for a maximum of comfort and support. Of particular note is its high-density layer that supports your pressure points. It also ha a contour-cut base layer for long lasting durability and better spine support. The transition layer is perfect for even weight distribution, essential if you or your partner tends to move a lot. This layer will help keep each of you on your own side of the bed and make it less likely that tossing and turning will wake the other. These beds are available in a wide range of sizes so there is sure to be a size to fit your existing bed. But if you have any doubts, the customer service team is extremely proactive. The mattress is delivered boxed and rolled, if you don’t have any help, you may struggle to get it upstairs as the larger sizes are very heavy. However, you could pay for a premium service to have it set up in the room of your choice and also have your old mattress removed. Aside from its superior comfort levels, it is extremely practical as its cover can be removed and machine washed. This is perfect if you have children, pets or you’re a little clumsy with breakfast in bed. This mattress is rated firm, although it does have a comfortable amount of “give” to it. There are a couple of downsides, though. If you feel the heat easily, then this mattress does tend to sleep on the warmer side, so this may not be the right choice for you. Also, a few users said this mattress is slightly less comfortable for side and front sleepers. If you’re a back sleeper, you will really appreciate its high levels of comfort and support. The Casper is a high-quality mattress. Its manufacturers are proud of their product and stand by its superior construction, so much so that every bed comes with a 10-year limited warranty. it can also be tried at home for 100 nights, during which you can return it if you are not fully satisfied. The Silentnight Seven Zone Mattress is a good choice if you are looking for a firm mattress to help to alleviate back pain. With its 20cm depth for added firmness and seven-zone core support system, sleeping on this mattress will allow you to wake refreshed after a supportive night’s sleep. The Miratex support system has been specifically designed to relieve pressure whilst being supportive enough to ensure correct spinal alignment and head-to-toe adapted support across core zones. There is also a thick layer of material that moulds to your body for extra comfort. The cover is made from a soft quilted knitted fabric which helps to make this mattress more breathable, while the mattress also features Purotex. This treatment is approved by the British Allergy Foundation for a cleaner and fresher bed. If you have any allergies, then this mattress makes an excellent choice. 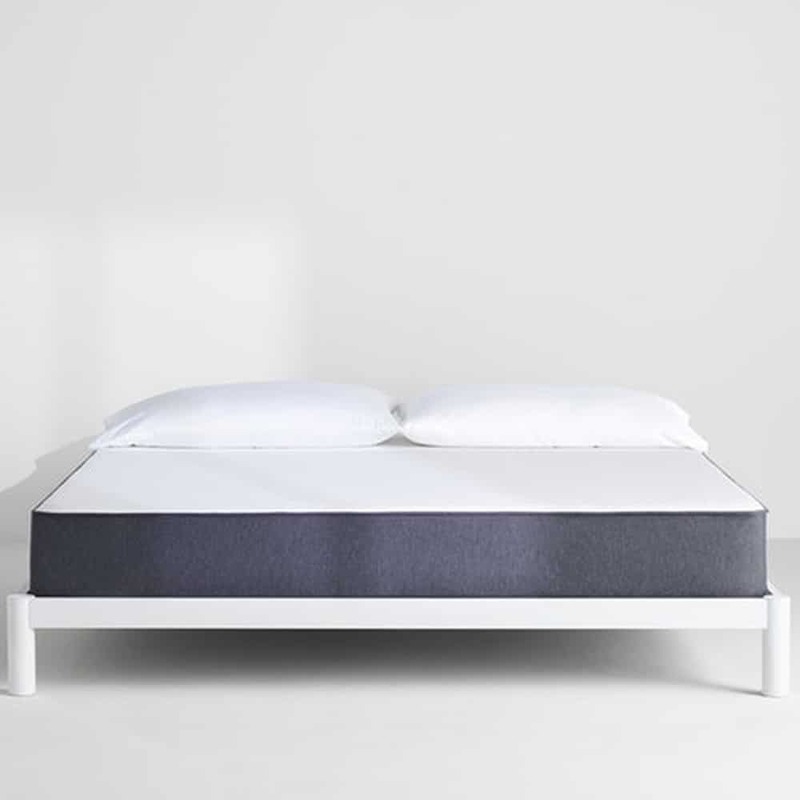 It is also ideal if you require extra lumbar support, however, while this mattress is a comfortable choice for sleeping alone, some of the support it offers is lost when two people share a bed. For couples, you may want to take a look at some of the other beds we reviewed. This mattress is delivered wrapped and rolled for convenience, however, it does give off a rather powerful chemical odour. While the manufacturer recommends airing the mattress before use for a day, in reality, you may want to leave it a little longer and if possible in another room, so it does not affect your sleep. If you are very sensitive to odours, then you may want to take a look at some of our other top mattress choices for back sufferers. Upon unwrapping, the mattress regains its original size, however, some of its dimensions are inconsistent with those stated on the packaging, notably the depth and in some cases there may be a gap around the edges of your bed frame. Therefore, if you think this is the mattress for you, we recommend reading up on the seller’s returns policy – just in case it does not fit as you wished. On the whole, this Silentnight mattress is a great choice for back pain sufferers who require a firm mattress. The body-moulding material and anti-allergy treatment are excellent additions, however, for couples, we recommend looking at other beds that are great at supporting a couple. It can often be difficult to find an appropriate mattress for side sleepers with lower back pain. However, the Dormeo with its layers of memory foam and Ecocell does just that! While we’re all familiar with memory foam that moulds to your body for extra comfort, Ecocell is a next-generation material that has been designed for extra longevity and support. 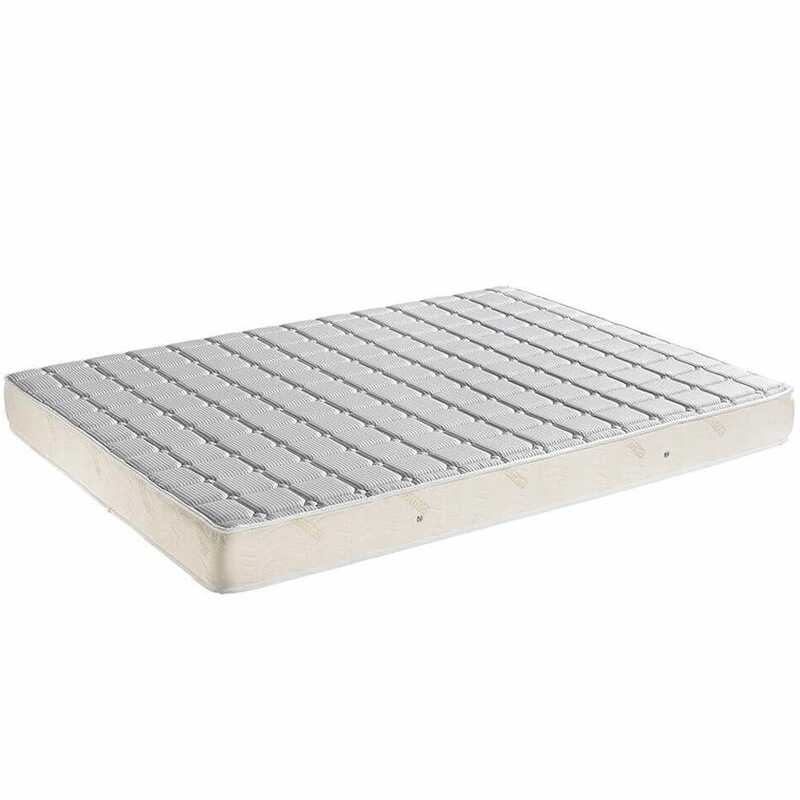 Its 3D cellular style construction allows permanent elasticity and helps to make the mattress more breathable and increases support to your pressure points for a more comfortable night’s sleep. Its improved elasticity also extends the mattress lifespan, so you won’t need to replace it for many years. It is thinner than most other mattresses in its class, with just 17cm depth. The fact that it is so comfortable at less depth is a testament to the manufacturer’s quality of construction and the technologies they have developed. However, if you use fitted bedsheets and your previous mattress was of a more standard depth you may want to change to unfitted sheets or put up with ill-fitting, baggy bed linen. In terms of hygiene, Dormeo has treated the mattress cover with their Sanitized treatment that makes it antibacterial, anti-microbial and anti-dust mite. As a further protective step, carbon fibres woven directly into the cover provide a barrier to dust and air particles, keeping your mattress hygienically clean for a more comfortable night’s sleep. This mattress comes complete with a 15-year guarantee, proof of the confidence that the manufacturers have in their product. The only downsides are the chemical smell that tends to linger for quite some time and like most foam mattresses, you may be a little on the hot side during spells of warm weather. 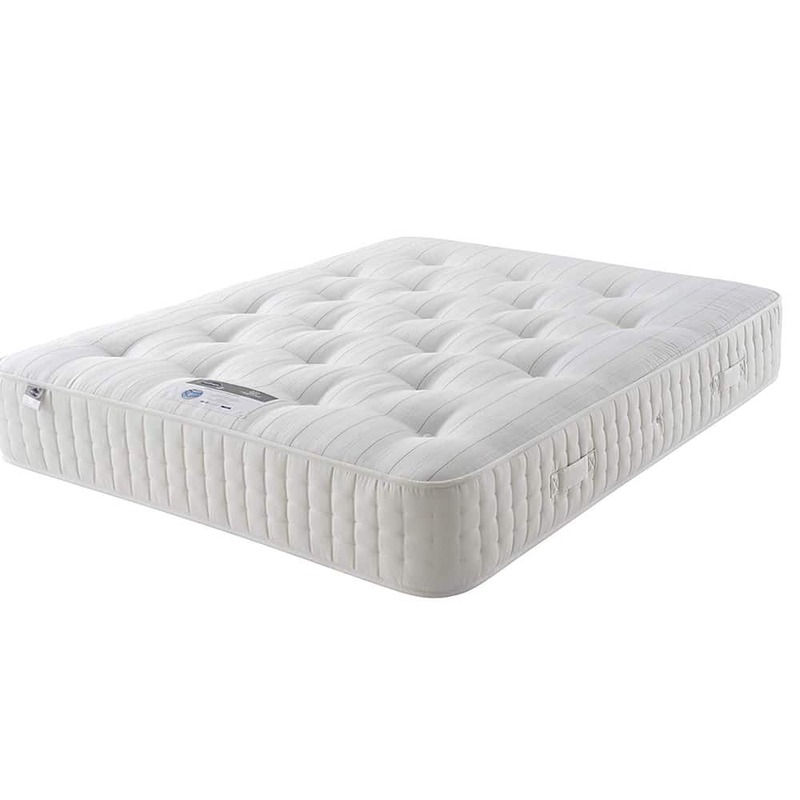 This Silentnight 2000 pocket spring mattress is our favourite pocket spring mattress. 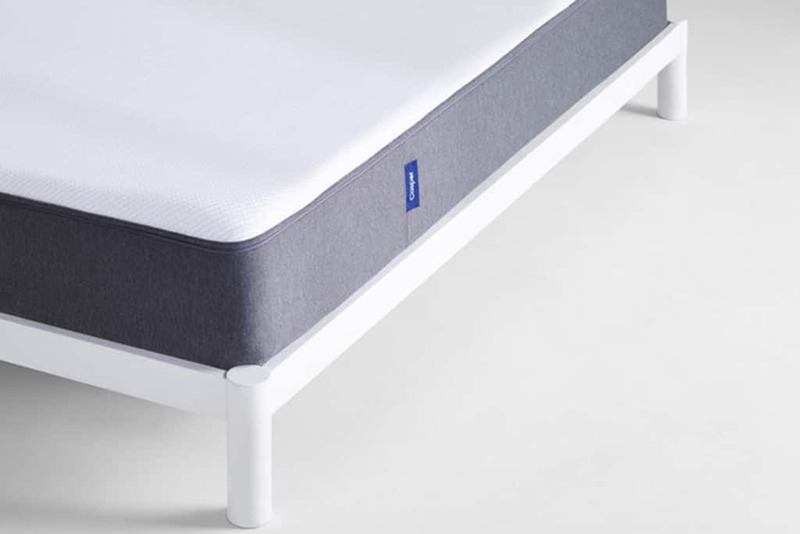 Regardless of your sleeping position, this mattress will relieve pressure over your back, shoulders and hips thanks to Silentnight’s Mirapocket spring system. With 2,000 individually nested springs in a double layer, you can be sure that your body will be comfortably supported throughout the night. This mattress is rated medium to soft in terms of comfort and it contains natural wool. Wool is reputed for its thermoregulatory qualities, so if you tend to feel the heat and find foam mattresses to be too warm, then this mattress could be what you’re looking for. It is also hypoallergenic, so if you suffer from any allergies, this mattress would be a good addition to your bedroom for a better night’s sleep. 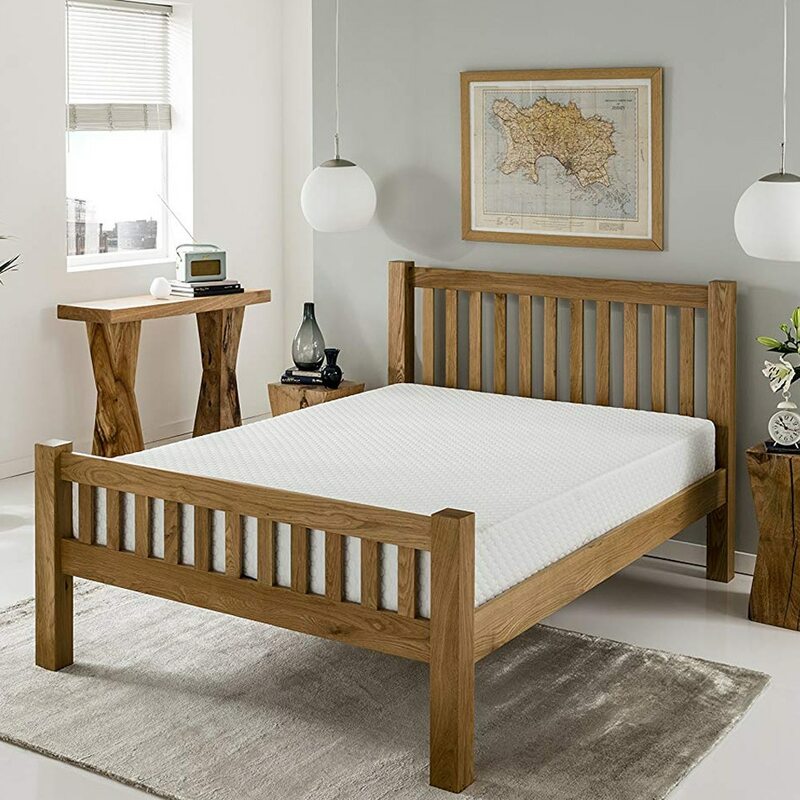 Although it is very supportive which makes it a great choice for couples, its generous 30.5cm depth may mean that you need to buy new bed linen or even a new frame to accommodate it. Be sure to check the dimensions of your existing items before purchasing. As with all Silentnight mattresses, this mattress is fully tried and tested for both safety and quality. This particular model comes with a five-year guarantee for added peace of mind. However, while this 30.5cm deep mattress is comfortable and supportive, it can tend to sag with time. Also, it is extremely heavy and will require two persons to turn it, something which will need doing more regularly with time. So if you live alone and aren’t very strong, you may struggle with this mattress. All in all, this is a good mattress to help ease back pain for those who prefer very supportive mattresses at a medium/soft comfort level, without summer heat build up. If you’re looking for the best of both worlds, then the Simba Hybrid Mattress could be just what you need to alleviate your back pain and finally get comfortable during nighttime. It combines 2,500 conical pocket springs with layers of responsive material for a comfortable night’s sleep whether you’re a side, front or back sleeper. The company has analyzed sleeping data from millions of people in order to create mattresses that suit all body types and sleeping styles. It’s also a great choice for couples of all body sizes, as the combination of the zoned base and the individual springs allow for independent movement. This means you can toss and turn or get up without waking your partner. The supportiveness of the springs and the zoned base make this mattress one of the best beds available to help relieve back pain. If you struggle to sleep in the summer, you’ll be pleased to learn that this mattress does not lead to overheating in hotter weather. This is due to its breathable cover, that is also hypoallergenic, as well as its innovative cooling comfort layer. The quality of the cover is great, however, it is a little on the fragile side so we’d recommend using a mattress protector, especially if you have children or pets. Like the majority of foam mattresses, it does have a chemical smell that can take a while to clear. So, be sure to give it a good while to air before using it and putting on your bed linen, or else you may find that the smell lasts for much longer. While the packaging is compact, the box is understandably rather heavy and if you are not particularly strong and are alone, you may struggle to get it up your stairs. This really is an excellent mattress that has helped countless numbers of people with back pain to sleep well. The combination of springs with different materials and a zoned base allow for comfort provide a superior level of supportiveness without feeling too “hard”. In fact, the manufacturer is so confident in their product that they offer a 100-day in home trial and a 10-year guarantee. 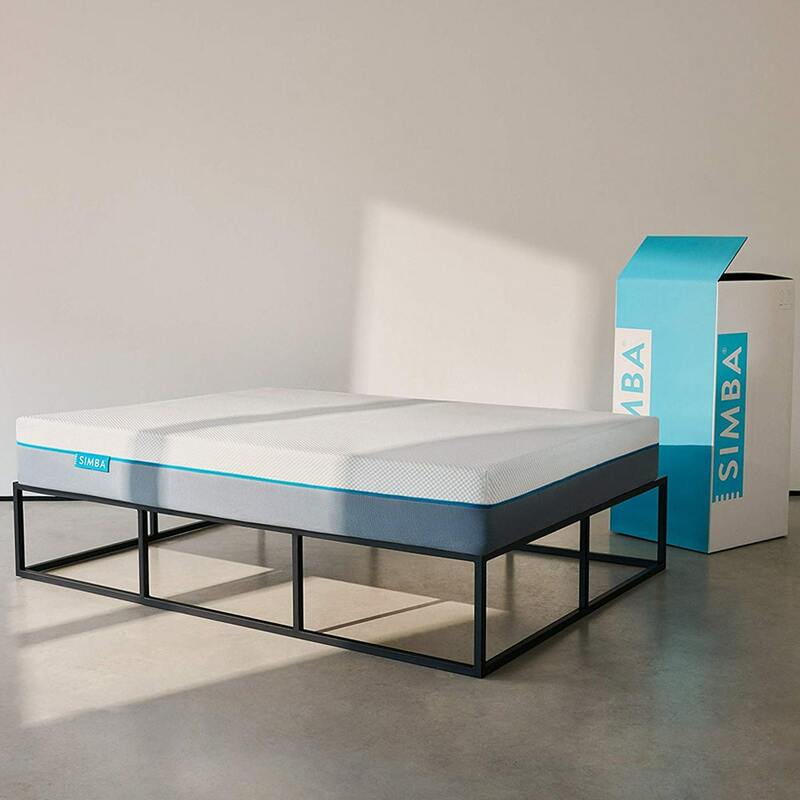 If you are struggling to find a mattress for lower back pain that’s compatible with you and your partner’s sleeping styles, then the Simba Hybrid Mattress is a great choice. Back pain is very common. In fact, 80% of the UK population will suffer from back pain at some point in their lives. Trying to get comfortable in bed if you have back pain can be difficult. However, the last thing you want to do is make matters worse by sleeping in a position which will exacerbate your problem further. There are a few positions you can try to minimise your pain. The key to each of them is maintaining a supportive spinal alignment by maintaining its natural curve. You could sleep on your side with a pillow between your knees, on your stomach with a pillow under your hips, or on your back with a pillow underneath your knees. No matter which position you prefer, you need to make sure the area between your shoulder and your head is supported by a pillow – to keep the neck aligned with the rest of your spine. The pillow you use shouldn’t be so thick or thin that there’s a bend in the neck so memory foam pillows might be an ideal choice. Upon waking, you should also be extra careful to get out of bed without placing undue spinal stress and back muscle strain. Don’t just sit straight up or twist yourself. The gentlest method is to roll onto your side, place your hands on the bed and use them to push yourself up as you simultaneously swing your legs down to the floor. Be sure to stand up slowly and avoid sudden movements upon waking. When getting into bed, you can simply reverse this guide to limit the pressure on your back. Choosing a mattress is an important decision, but even more so if you suffer from back pain. Below, we examine the most important features that will guide you as you consider looking for the best mattress for a bad back. Finding mattresses for back means choosing beds which offer the right amount of spinal support. The mattress shouldn’t leave your spinal area and surrounding muscles struggling to maintain a neutral position. Mattresses that are too soft won’t be supportive where you need it. On the other hand, mattresses that are too hards can place more pressure on the areas which are sore. In most cases, the best type of mattress for back pain is a little firmer than usual. This will be supportive of the natural spinal alignment but won’t be too hard so that it increases your discomfort. In much the same way, the right mattress for sore back should help you to keep your spine properly aligned. Your spinal cord is made up of three curves: a C-shaped curve at the neck, a reverse C-shaped curve behind the rib cage and another C-shaped curve at the lower back. These are known as the cervical, thoracic and lumbar regions respectively. You may feel back pain in any of these areas, but the lower back or lumbar area is the most common. This lumbar curve must be maintained and continuously supported by your choice of mattress. If the mattress sags when you sleep and brings your spinal cord out of alignment, this will make your pain worse. There shouldn’t be any gaps between your body and the mattress for best results. When choosing the best mattress for back pain in the UK, it’s not just about being supportive and having proper alignment – comfort is crucial too. If you aren’t comfortable, you are highly unlikely to get a good night’s rest. This will increase your stress levels and place more strain on your body. Whichever mattress you choose, you should give it a good ‘test drive’ first to make sure it’s comfortable for you. Many manufacturers offer a trial period, so you can sleep on the mattress for a few nights before making your decision. Breathability is another important consideration. If you often find yourself feeling too warm at night, you should choose an orthopaedic mattress for back pain that’s made from natural or breathable synthetic materials to increase your comfort. Firmness is perhaps the most important feature when choosing the best bed for a bad back. Research has shown that a firm mattress for back pain reduces discomfort and can also improve sleep quality. The right firmness for you will depend on your preferred sleeping position. If you like to sleep on your side, a mattress which is the softer side of firm will be the best option. This is because you can ‘sink’ into the mattress a little, which helps maintain the alignment of your spine when on your side. If you like to sleep on your stomach, medium/firm is best – this prevents your pelvis from sinking into the bed and coming out of alignment with your shoulders. A hard mattress for back pain works well if you like to sleep on your back. But you will feel the benefit from medium/firm types too. This really comes down to personal preference. It is also important to consider your bodyweight when choosing the best mattress for a bad back. If you’re quite heavy, you should choose the firmest mattress for you can while feeling comfortable. This is because the heavier you are, the more support you will require to maintain the natural curve of your spine. If you’re struggling to find the best mattress for a bad back, any of the mattresses we have reviewed should help you manage pain at night. But overall, we think the best mattress for back pain in the UK is The Casper Mattress. This mattress is made up of four layers, which mould to the contours of your body for optimum relief. As you sleep, your spine is kept perfectly aligned and supported, so your back muscles can relax. Also, should you share a bed with your partner, any movement is kept isolated to their side – so you won’t be disturbed from your slumber if they toss and turn. Furthermore, it is supremely comfortable, durable and easy to clean. The cover can be conveniently removed for washing, which saves you lots of hassle in the long run. And best of all, if you’re not sure whether or not this mattress is suitable for you, you can take it at home and try it out for 100 nights before committing. All in all, if you’re looking for the best mattresses for a bad back – look no further than the Casper Mattress.